A double-decker bus is a bus that has two storeys or decks. Double-decker buses are used for mass transport in the United Kingdom, Europe, Asia and many former European possessions, the most iconic example being the red London bus. Early double-deckers put the driver in a separate cab. Passenger access was via an open platform at the rear, and a bus conductor would collect fares. Modern double-deckers have a main entrance door at the front, and the driver takes fares, thus halving the number of bus workers aboard, but slowing the boarding process. The rear open platform, popular with passengers, was abandoned for safety reasons, as there was a risk of passengers falling when running and jumping onto the bus. Double-deckers are primarily for commuter transport but open-top models are used as sight-seeing buses for tourists. William Gladstone, speaking of London's double-deck horse drawn omnibuses, once observed that "...the best way to see London is from the top of a bus". Cities listed here have double-decker buses as part of their regular mass transit fleet. Cities with only tourist and sightseeing double-decker buses are excluded. 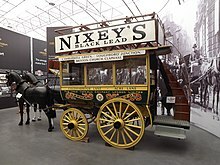 An historical Brixton to Clapham horse-drawn bus on display at London Bus Museum. The first commercial horse-drawn double-decker omnibuses were introduced in England in 1847 by Adams & Co. of Fairfield, Bow, then improved upon by John Greenwood, who introduced a new double-decker in 1852. Double-decker buses are in common use throughout the United Kingdom, and have been favoured over articulated buses by many operators because of the shorter length of double-deckers and larger amount of seating capacity; they also may be safer to operate through the narrow streets and tight corners common in Britain. The majority of double-decker buses in the UK are between 9.5 metres (31 ft 2 in) and 11.1 metres (36 ft 5 in) long, the latter being more common since the mid-1990s, though there are three-axle 12-metre (39-foot-4-inch) models in service with some operators. Double-decker coaches in the UK have traditionally been 12.0 metres (39 feet 4 inches) in length, though many newer models are about 13.75 metres (45 ft 1 in). Coaches are normally built to 4.38 metres (14 ft 4 in) high, while 'highbridge' buses are normally about 20 centimetres (8 in) taller. Articulated double-deckers are also allowed at a maximum length of 18.65 metres (61 ft 2 in). In 1941, Miss Phyllis Thompson became the first woman licensed to drive a double-decker vehicle in the United Kingdom. She drove for the bus company Felix Bus Services, then at Hatfield near Doncaster. The red double-decker buses in London have become a national symbol of England. The majority of buses in London are double-deckers. A particularly iconic example was the AEC Routemaster bus, which had been a staple of the public transport network in London for nearly half a century following its introduction in 1956. Because of cited difficulties accommodating disabled passengers, the last remaining Routemasters in use finally retired from general service in 2005. Transport for London has continued to keep these vintage buses in operation on heritage route 15H, there was formerly a second heritage route (9H) but this ceased operation in 2014 due to low patronage and increased operation costs. In 2007, a hybrid-powered double-decker entered service on London Buses route 141. By late 2008, more hybrid double-deckers from three manufacturers entered service in London. A New Routemaster was developed that year, and entered service on 20 February 2012. In October 2015, London added five all-electric double-decker buses - the world's first - made by Chinese firm BYD. Bus Vannin operate several double-deckers on routes all across the island. In the Republic of Ireland, nearly all of buses operated in and around Greater Dublin by Dublin Bus are double-deckers. There are 936 double-decker buses (second after London) in the company's fleet of 942. Bus Éireann also utilises double-decker buses on some of its commuter routes, such as the Dublin to Dundalk service. Double-deckers are also common on some of the company's suburban routes in Cork city. More luxurious Double-Deckers are used on Intercity Routes like the XI Dublin-Belfast Route or X3/X4 Dublin-Derry route. Double decker buses were in use on city services in Vienna between 1960 and 1991. They are used on services between Vienna and its airport, and also operated by Ötztaler Verkehrsgesellschaft (ÖVG) under contract to ÖBB-Postbus on service 4420 between Innsbruck and Lienz. Since 1970, various operators of Copenhagen city transport were using double-deckers—originally Leyland, in the 1980s-90s MAN and in the 2000s Volvo, derivates of model B7. Left, double-decker bus Schneider Brillié P2; Center, double decker horse-drawn omnibus in Paris, France. The first French double-decker bus was brought into service in Paris in 1853; it was a horse-drawn omnibus. The upper floor was cheaper and often uncovered. The first double-decker motor bus in Paris, the Schneider Brillié P2, appeared in 1906. It was designed to carry more passengers and to replace the horse-drawn double-decker omnibus. Like trams and omnibuses, double-decker motor buses included two classes of travel: first class inside the car and second class outdoors on top. But this type of vehicle was withdrawn in 1911 because one of them overturned at place de l'Étoile; following this incident the P2s lost their upper deck and were renamed as P3s. It was not until 1966 that the RATP retried double-deckers on two lines in Paris. A prototype built by Berliet (type E-PCMR), was put into service in 1966, with an order being placed for 25 vehicles. The first production car was commissioned on 19 June 1968 on line 94, Gare Montparnasse - Levallois. On 17 February 1969, line 53, Opera - Porte d'Asnieres was in turn equipped with this model. But traffic problems caused RATP to definitively abandon this vehicle in 1977, because this type of bus is poorly suited to the structure of the Paris network, the stops being too close to each other which prevented people from going upstairs. Hence, there are no Parisian mass transit lines using double-decker buses. SITAC operates a service 5 between Calais and Sangatte using a double decker bus. In Germany, double-decker buses in Berlin are operated by Berliner Verkehrsbetriebe (BVG). The fleet of double-decker buses in Berlin fell from 1,000 in 1992 to 450 in 2002. The models in operation in 2004 were 13.5 metres (44 ft 3 in) long and held around 95 passengers. The replacements, which are supplied by Neoman Bus, are 1.8 metres (5 ft 11 in) longer. The new buses are able to hold 128 passengers. Liemobil operates 4 double decker MAN A39 buses on service 11 between Sargans, Switzerland and Feldkirch, Vorarlberg, Austria and on other services 12, 13 & 14 in the country. It is only very recently that double-decker buses have started to be used in the Netherlands. On 10 December 2017 Connexxion put 18 3-axle double deckers into service on route 346 between Haarlem and Amsterdam Zuid, a heavily-used commuter route not served by rail. They are Futura FDD2s built by VDL Bus & Coach in Valkenswaard, are 14.1 metres long, and carry 86 seated passengers. Their introduction was not without problems since their route initially had to be diverted to avoid passing under a dangerously low tram overhead wire near the VU Medical Centre stop. Also in December 2017, Qbuzz introduced 5 double-deckers on its route 300 between Groningen and Emmen. These are Van Hool TDX27 Astromegas, also 14.1 metres long and carrying 85 passengers. The Macedonian government bought 217 Yutong City Master double-decker city buses for local transport in Skopje, the capital. The first shipment of 68 custom-made buses arrived in Skopje in 2011 from China’s Zhengzhou Yutong factory. The buses were put into operation on 8 September 2011, coinciding with the day of Macedonian independence. This model of bus has capacity for 80 passengers. In June 2008 Boreal Transport on contract with Kolumbus introduced three double-decker buses to provide more seating for certain high-traffic departures in Stavanger. Until 2011 double-decker buses were operating in the city of Barnaul. The double-decker fleet consisted of 7 MAN SD200 and MAN SD202 second hand buses imported from Berlin. Those buses were used on routes 3, 10 and 17. In the mid-1990s, some double-deckers were operated briefly in Saint Petersburg. Double-decker buses were introduced in 2014 in Bilbao by the city bus operator Bilbobus. They are not the first double deck vehicles in the city as ex-London Transport Q1 trolleybuses were sold to Bilbao after the end of London trolleybus operations in 1962 and were operated until the system's closure in 1978. Initially, six vehicles are operating on Bilbobus route 56. They have a capacity of 132 passengers - 80 seated and fifty standing. Sweden bought in 1965 50 Leyland Atlantean double-decker buses with Park Royal bodies. Leyland claimed they were the first double-decker buses with one man operation. They had two staircases and two pairs of doors. The Atlanteans were not replaced at the end of their revenue service life in 1974. Recently, however, in 2011 double-deckers returned to Sweden on revenue duties with VDL Synergy on in the SL 676 Stockholm Östra - Norrtälje line. Norrtälje is located around 70 km north of Stockholm. In Switzerland Postauto operate double decker buses on a route between Engelburg–St Gallen–Heiden routes and in the Obertoggenburg region and in the regions of Rorschach and Goldach. 19 Alexander Dennis Enviro500 have been ordered to operate on these services, which seat 80 passengers and can carry 48 standing. Four double deckers are also operated in Graubünden which are due to be replaced within the next two years. In Turkey, the Istanbul public transit system (IETT) runs 89 double-decker buses on longer-distance routes, most notably commuter buses crossing the Bosphorus Bridge linking the European and the Asian sides of the city. Double-decker buses are also used on routes to and from Taksim Square to far-flung western suburbs such as Büyükçekmece and Bahcesehir. Double-decker buses can be found in several locations in Africa, such as Alexandria in Egypt and Johannesburg (Metrobus), City of Tshwane, and Cape Town (Golden Arrow Bus Services) in South Africa as well as Mombasa, Kenya. The Bangladesh Road Transport Corporation operates a fleet of Ashok Leyland buses on the streets of Dhaka and Chittagong. Earlier, some Volvo B10M/Alexander buses also used to run in Dhaka, but most of those have been dumped recently. Several cities in continental China have double-deckers in regular use on certain crowded lines, while some have a few double-deck buses in use on lines which also use single-deck vehicles, e.g. Nanning on line #704 in peak hours. Guilin is leading city that operate double-deckers regularly in major routes; in its main street the double-deckers prevails and run one-by-one almost every minute. Besides Guilin and Nanning, Beijing, Shanghai, Guangzhou, Shenzhen, Tianjin, Hangzhou, Wuhan, Dalian, Foshan and Kunming also have those buses in service, particularly on routes during rush hours. Larger towns in the developed coastal provinces, including Shaoxing, Zhejiang province, use double-decker buses. The former British colony of Hong Kong introduced its first double-decker buses in 1949 by Kowloon Motor Bus. They have become very popular since then, and they are found in large numbers among the fleets of the territory's major bus operators (see below). By law, double-decker buses in Hong Kong are limited to a length of 12.8 metres (42 feet). Today, the majority of buses running in Hong Kong are double-decker buses, and all of them are air-conditioned. Also, Hong Kong has a double-deck trams system, one of three only in the world as of 2015 and the only fleet which is all double-deck. In India, Hyderabad and Bangalore had double deckers for a while before discontinuing. Madras's Metropolitan Transport Corporation (MTC) has a small fleet of double-decker buses, mostly in the high-density, longer distance routes. Mumbai has operated double-decker buses since 1937. They are operated by the Brihanmumbai Electric Supply and Transport undertaking. Kerala State Road Transport Corporation is operating double deckers in Thiruvananthapuram and Kochi cities. Kolkata and also has double-decker buses. They are modelled on the London buses. Ashok Leyland Titan double decker buses are used in all cities. Articulated double-decker buses from Ashok Leyland were used till they were phased out in the early 1990s as they were thought to be unsuitable for city traffic. Recently in Kolkata, CSTC reintroduced double decker bus with music system on selected routes where wide road space was available, i.e. no over-head cables, low bridges or flyovers. CSTC has spent 1 million INR to renovate 1 bus. Today, double deckers exist only in Mumbai, Vadodara, Kolkata, Kochi and Thiruvananthapuram. Indonesia first operated its double-decker bus fleet in 1968, with Leyland Titan double-decker bus first operated in Jakarta. The double-decker bus service linked Salemba in Central Jakarta with Blok M area in South Jakarta from 1968 to 1982. Between 1984 and 1996, the Jakarta municipal bus service, Perusahaan Umum Pengangkutan Penumpang Djakarta (Perum PPD) operated a fleet of 180 Volvo B55 double-decker buses, connecting various corners in the city. The double-decker bus service ceased to operate in 1996 due to aging fleet, lack of spare parts, and there are no plan to renew the double-decker fleet in Jakarta. By that time, the remnant of double-decker bus body were sold and repurposed as bus-themed clothing store in Blok M and restaurant in Senayan (now SCBD) area, but now the establishment has been demolished. By the early 2000s, the PPD has shifted their bus fleet from European built double-decker buses to cheaper second-hand Japanese buses and imported articulated buses from China. By that time, the double-decker seems to be lost in favour of articulated bus, which provides more exit and entry points to accommodate faster embarkment. By 2004 the TransJakarta bus rapid transit began its service in Jakarta, but uses no double-decker bus and chosen conventional and articulated buses instead. Since February 2014, the Jakarta Government provides free double-decker bus tours that offers sightseeing in Central Jakarta. The buses' route covers tourist attractions, such as Monas, Istiqlal Mosque, the Cathedral, National Museum, Sarinah, and Plaza Indonesia, as well as Grand Indonesia shopping centres. As 2016 there are 18 double-decker busses in Jakarta, and the service is expanded to include Kota Tua and Gelora Bung Karno Stadium in Senayan area via Sudirman avenue. Other than the capital Jakarta, there are some cities in Indonesia that have operated double-decker buses, mostly as city sightseeing tour service. They are Bandung and Surakarta. The Bandros is a double-decker tourist bus operating in Bandung since 2014. Double-decker bus in Baghdad, Iraq. First used in 1938 and continued until 2003. They became part of the Iraqi culture and resumed operating in Baghdad in 2013 with modern buses. A fare can't reach more than 45 U.S. cents or 500 Iraqi Dinars. The double-decker buses in Baghdad were the first to enter the Middle East and the Arabic world. By Japanese law, vehicles are confined to maximum 3.8 metres (12 ft 6 in) height and 12.0 metres (39 ft 4 in) length. Japanese double-decker buses are mainly used for inter-city highway buses (i.e., motor coaches), city tours, and charter buses. In 1960, Kinki Sharyo and Hino Motors manufactured the first original double-decker bus "Vista Coach" for Kinki Nippon Railway (Kintetsu). In 1979, Chuo Kotsu, a chartered bus operator in Osaka, imported the Neoplan Skyliner. Skyliner, and the other imported buses: Van Hool Astromega TD824, Drögmöller E440 Meteor, and a few MAN coaches inspired Japanese bus manufactures, who developed three domestic models in the mid-1980s: "Nissan Diesel Space Dream", "Hino Grand View" and "Mitsubishi Fuso Aero King". They did not, however, sell very well as the ceiling was only 1.7 metres (5 ft 7 in) high. Nevertheless, Aero King was sold for 22 years, but, being unable to meet exhaust gas emission and safety levels, production stopped in 2005. In 1982, Toei Bus operated Neoplan Skyliners in Tokyo, between Asakusa and Ueno to 2001. Joban Kotsu operated Skyliners in a trans-Fukushima route: between Iwaki and Aizu-Wakamatsu via Koriyama from 1983 to 1996. Since the 1990s, JR Buses started to use Aero King for an overnight inter-city highway bus service named "Dream-go". The first Aero King in Dream-go, operated to "Fuku Fuku Tokyo" between Tokyo and Shimonoseki, Yamaguchi with Sanden Kotsu, which was replaced with a "super high-decker" coach in middle of the 1990s, "Fuku Fuku Tokyo," and finally stopped in 2006. Japanese overnight highway buses are mainly equipped with a three-line, two-aisle (1+1+1) seat configuration with reclining seats. When this configuration is used on an ordinary coach, it has 28, 29 or 31 seats. When this configuration is used on a double-decker bus, it has 36 or 40 seats: the vehicle's price and capacity increase while operating cost decreases. JR Bus group mainly uses Aero King, Skyliner, and a few Jonckheere Monaco (equipped with Nissan Diesel engine) for inter-city highway bus operations between Kanto (near Tokyo) and Kansai (near Osaka), which is named "Dream-go" (overnight express) and "Hiru-tokkyu" (Daytime Express). The other bus operators, inspired by "Dream-go", increased use of the Aero King for overnight inter-city bus service. JR Bus Kanto imported four Neoplan Megaliner N128/4, leasing two to an operating partner (from 2003 to 2006, Kanto Railway, since 2006 Nishinihon JR Bus). The Megaliner is 15.0 metres (49 ft 3 in) long, and has 84 seats (with 2+2 configuration), and is operated on an inter-city highway route between Tokyo and Tsukuba, Ibaraki from 2002 to 2005. The Megaliner has also been converted for a low-price overnight highway bus service between Tokyo and Osaka called "Seishun Mega Dream-go," with special authorisation. In the former Portuguese territory of Macau, Fok Lei and its successor Transmac used second-hand double-deckers widely from the early 1970s until the late 1980s. A Rapid KL Alexander Dennis Enviro500 during a test run in Cheras, Malaysia. Malaysia has historically seen the use of double-decker buses in mass transit to varying degrees, but were significantly limited in use due operational costs and driving spaces needed for such buses. Early double-decker municipal buses primarily existed in Malaya within the Kuala Lumpur area of Selangor and George Town, Penang between the late 1940s and the early 1960s, when double-deckers were eventually withdrawn in favour of cheaper and more agile single-deck buses. The earliest recorded use of double-deckers by Malayan bus companies was in Selangor in 1948 when the Toong Fong Omnibus Company acquired two Park Royal-built Guy Arab IIIs at a cost of M$40,000 each; the General Transport Company (GTC) followed by acquiring Park Royal-built AEC Regent IIIs. While the buses saw service for over a decade, all of them were taken out of service for a variety of reasons and were never replaced with new double-deckers; the buses were often obstructed by narrow streets, trees, low bridges, and increasing overhead wires, while passengers eventually favoured staying on the lower deck of the bus; the cost of operating the buses was also higher due to a local vehicle tax calculated based on the number of seats of a taxed vehicle. One Toong Fong double-decker was burned in the late-1950s by communist insurgents, while the remaining double-deckers were ultimately disused by the mid-1960s due to age. The successor of the GTC, Sri Jaya, experimented with a reintroduction of double-deckers in 1989 by leasing a Singapore-assembled, 102-seat Leyland Olympian for use within Kuala Lumpur for 6 months, but found that street conditions were problematic as before and discontinued the use of the bus after the trial. In George Town, Penang, five retired AEC C1-type double-decker trolleybuses were procured in 1956 by the George Town Municipal Tramways from London Transport as an experiment for the possible use of double-decker buses in George Town. Poor performance results and the advancing ages of the buses, coupled with efforts to replace the entire trolleybus fleet with single-deck diesel-powered buses in the 1960s, led to the withdrawal of the only double-deck buses in early Penangite public transport. Following increasing public bus ridership, more open roadways and the feasibility of operating double-deck Hop-On Hop-Off tourist buses within Kuala Lumpur, Prasarana Malaysia purchased 40 (revised from an earlier 111) Alexander Dennis Enviro500 double-decker buses in 2014 to serve high volume Rapid KL Rapid Bus routes; with a capacity of 108 passengers each, it is double that of a contemporary single-deck bus in the fleet. The first five buses of the batch entered service in September 2015; with the rest of the fleet gradually added into service in the following months. Feasibility studies were also conducted by Prasarana Malaysia on the reintroduction of double-deckers in Penang through Rapid Penang's bus service in 2015. Beyond mass transit, double-deckers have seen widespread use as long-distance coaches since the late-2000s in response to growing demand for intercity travel, as expressways and outlying bus stops lack physical obstacles that plagued urban bus services. In October 1953, a single AEC Regent III double-decker from the fleet of the Kuala Lumpur, Malaya-based General Transport Company was sent to Singapore for demonstration. It was used on service by the Singapore Traction Company for two weeks. After that, it was inspected by two other bus companies, and then sent back to KL. However, no orders for double-deckers immediately followed. Singapore Bus Service (SBS, present-day SBS Transit), which for many years was the only operator of double-decker buses in Singapore, launched its first double-decker bus service on 13 June 1977 with 20 Leyland Atlanteans running on service 86 and launched by then-Deputy Prime Minister and Minister of Communications Ong Teng Cheong. The success of the 1977 Leyland Atlanteans would lead to SBS purchasing another 500 Leyland Atlantean AN68 buses from 1978 up to 1984 while also trialing several demonstrators such as the Volvo B55, Dennis Dominator, Scania BR112DH and Volvo Citybus concurrently. The next batch of double-deck buses was introduced from 1984 to 1986 and consists of the Mercedes-Benz O305 and the Leyland Olympian, both of which were bodied by Walter Alexander Coachbuilders with an R-type body. In 1993, the first air-conditioned 12-metre (as opposed to the average 10.5-metre length then) double-decker bus, the Leyland Olympian 3-axle was launched as the "Superbus". The original 200 "Superbuses" were followed by an additional 471 Volvo Olympian 3-axle "Superbuses" and 100 non air-conditioned Volvo Olympians from 1994 to 2000. The Volvo B10TL, the first stepless, ultra-low-floor "Superbus", was launched in 1999 while 20 low-floor Dennis Trident 3s followed in 2001. The first wheelchair-accessible double-decker buses, the Volvo B9TLs, were introduced in 2006; by 2014, SBS Transit had over 1631 of these buses in service. SBS Transit's monopoly on double-decker buses in Singapore ended in 2014 when rival SMRT Buses ordered 201 Alexander Dennis Enviro500 buses. It was followed up with 16 MAN ND323F A95 buses in 2015. Some of the existing double-deckers owned by SMRT Buses and SBS Transit were transferred to new operators Tower Transit and Go-Ahead under the Bus Contracting Model. Subsequent orders of B9TL and A95 buses are being made by the Land Transport Authority, are painted in a lush green livery (rather than the operator-specific liveries of SMRT and SBS Transit), and are used by all operators. Currently, there are more than 3,000 double-decker buses in Singapore, all of which are air-conditioned and the majority wheelchair-accessible. Newer units introduced from 2018 onwards are also Euro 6-compliant and are equipped with USB charging ports and Visual Passenger Information Displays (VPIS). Outside public bus operations, open-top buses are also operated by Singapore Hippotours and CityTours FunVee for tourist sightseeing purposes. The New Routemaster from London also visited Singapore twice; once in 2014 and another in 2016. In 2015, a fleet of 20 double-decker buses was introduced for commuters making the journey between the capital Seoul and its surrounding Gyeonggi Province and nearby Incheon city in 2015 as a pilot project. In the 1950s, double-decker buses of the South Western Bus Company plied on the Galle Road in Colombo, Sri Lanka. These were taken over by the Ceylon Transport Board (CTB) when all bus services were nationalised in 1958. Beginning around 1959, large numbers of second-hand double-decker buses of the RT, RTL and RTW classes were imported by the CTB from London Transport, and ran in their original red livery with the oval CTB logo painted on the sides. These buses were phased out beginning in the mid-1970s, and none remain in service. Later, around 1985, 40 ex-London Routemaster entered service. One Routemaster bus is run by the Sirasa TV and radio station. Today's buses in Sri Lanka include AEC Routemaster (Currently phased out in order to make way for Volvo B9TL/East Lancs Nordic and incoming First Western Dennis Trident 2/Plaxton President - 2001/02), MCW Metrobus (including 12m parts), Leyland Atlantean, and Dennis Trident 2 (1999/2000), plus some of the Volvo B7TL/East Lancs Vyking and Volvo B9TL/East Lancs Nordic buses. Presently double-decker buses are used by the Mall of Asia Arena (Higer KLQ6119GSE3 B91H-series) and the Subic Bay Metropolitan Authority (King Long XMQ6110GS). Former operators were Manila Motor Company (Matorco), which introduced such buses to the Philippines, and the Metro Manila Transit Corporation (Leyland Atlantean). The first double-decker bus in decades to serve the riding public in the capital region debuted in January 2016, serving the SM City North Edsa-Ayala Center route. It also sports PWD and elderly sitting, a national first. In the entirety of Visayas and Mindanao region, Pabama Transport based in Bukidnon province in northern Mindanao was the first bus line to deploy double decker buses (Zhongtong LCK6148H Giant Magnate) which started servicing the riding public in June 2018. It was also the first in the country to field double-decker buses for provincial operations. In early 1990s two tri-axle Leyland Olympians were evaluated in Taipei and Taichung. The evaluation was unsuccessful and the buses were sold to Hong Kong for spares. Double deckers are also commonly found in Thailand nowadays. Previously there are Volvo B10M with Alexander bodies available. An Alexander Dennis Enviro500 equipped with bike rack, servicing Victoria, British Columbia, Canada. In 2000, the cities of Victoria and Kelowna, British Columbia placed an order for 10 Dennis Trident 3 buses imported from the United Kingdom, becoming the first cities in North America to use modern double-decker buses in their public transit systems. Several more orders have been placed since then, and as of 2017 BC Transit operates 69 double-decker buses, including Trident 3s and the newer Alexander Dennis Enviro500s, of which 62 operate on the Victoria Regional Transit System and the remaining 7 with the Kelowna Regional Transit System. In Victoria, the buses are mainly used on routes that go from downtown to the suburbs, and to the Swartz Bay Ferry Terminal near Sidney, B.C. They can also be found on routes that head to the University of Victoria and the Western Communities, and have proven to be very popular amongst both locals and tourists. TransLink, the transit authority of Metro Vancouver, British Columbia, tested 2 Enviro500 buses on lines 301, 311, 351, 354, 555, 601 and 620 between November 2017 and March 2018. It was announced soon after that 32 double-deckers will be purchased, arriving in 2019. From March 2009 to June 2012, three imported Alexander Dennis Enviro500 double-decker buses similar to those in Victoria were used on OC Transpo express routes on the Transitway in Ottawa, Ontario. Delivered in November 2008, these buses proved to be efficient in reducing costs, but their height prohibited their use on many routes. Consequently, these three buses were withdrawn and sold to Victoria in late 2012 after a new series of 75 Enviro500 buses with a lower height that met MTO regulations entered service earlier that year. As of 2018 OC Transpo has 133 of these buses. GO Transit, a regional transit system serving the Greater Toronto Area in Ontario is the largest user of double-decker buses in Canada, with over 150 such vehicles in service as of 2017. Its fleet comprises Alexander Dennis Enviro500s in a single-door, commuter-type configuration similar to its fleet of highway coaches. The first 22 entered service between 2008 and 2009, with its 4.3-metre (14 ft 1 1⁄4 in) roof height limiting usage to the Highway 407 corridor. 105 additional buses were delivered between 2012 and 2015 and feature a lower roof height of 4.1 metres (13 ft 5 3⁄8 in). The latest series of 253 buses, which is currently built in a local factory in Vaughan, has a roof height of 3.9 metres (12 ft 9 1⁄2 in) and is expected to replace most of the single-decker coach fleet by 2020, at which point 75% of the active fleet is expected to be composed of double-deckers. In 2018, the Toronto Transit Commission added Alexander Dennis double decker buses to its fleet. Strathcona County Transit of Strathcona County, Alberta started a pilot project in September 2010 which explored using different high-capacity bus types to carry more passengers on high-demand commuter routes between Strathcona County and Edmonton. This involved a one-year lease of an Alexander Dennis Enviro500 from the manufacturer. After completing a year of testing between September 2010 and October 2011, a firm order of 14 Enviro500s was placed in 2013 for their service between Sherwood Park and downtown Edmonton, with the first arriving in late August. Five more buses were ordered in 2016, bringing the fleet of double-deckers to 19 as of 2017. The Mexico City Metrobús bus rapid transit system started operating a fleet of 90 Alexander Dennis Enviro500s on its new line 7, along the city's iconic boulevard, Paseo de la Reforma, in February 2018. At least one double-decker bus is among those used on the Panama City-Colón route. A Van Hool US-specification double-decker bus in New York City, U.S.
With the exception of coaches, double-decker buses are uncommon in the United States. Many private operators, such as Megabus, run by Coach USA, employs double-decker buses on its busier intercity routes. For publicly run transport, articulated buses are generally preferred. Nonetheless, a handful of municipal operators use double-decker buses, primarily on the West Coast. In Davis, California, Unitrans, the student-run bus company of University of California, Davis, operates six double-decker buses imported from London. One of these buses has been converted to run on compressed natural gas (CNG). There was also the prototype GX-1 Scenicruiser of Greyhound Lines, which enters from the first floor: the second floor contains the driver's compartment and more seats. Citizens Area Transit, the transit authority in the Las Vegas, Nevada area, introduced a fleet of double-deckers to serve the Las Vegas Strip route in October 2005. The route is branded as "The Deuce". As of 2009 it serviced eight lines. In Snohomish County, Washington, Community Transit operates 45 Alexander Dennis Enviro500 double-decker buses, which are used on commuter routes between Snohomish County and Seattle. An initial order of 23 buses went into service in 2011, and a second order of 17 went into service in 2015. Sound Transit, another operator in the Seattle area, bought five double-decker buses through a Community Transit order and began operating their own fleet in 2015. In 2016, a joint procurement between three transit agencies in Washington state ordered additional double-decker buses from Alexander Dennis. Community Transit would order 17 buses, with an option for 40, Sound Transit would receive 32 with an option for 43, and Kitsap Transit would buy 11 of their own. In San Luis Obispo, California, SLO Transit tested a double-decker bus in late 2008 to see if it would alleviate the over-crowdedness of Route 4. The borrowed bus has been returned, and SLO Transit has purchased one double-decker bus of its own using a combination of Federal, State and local funding. The bus went into operation on 8 September 2010. In Los Angeles County, California, the Antelope Valley Transit Authority uses double-decker buses as part of its commuter service to the Los Angeles area. Also in Los Angeles, SCRTD used Neoplan AN 122/3 Skyliners double-decker buses from the late 70s until 1993. New York City phased out double-decker buses in 1960. They briefly returned from 1976 to 1978, although they only ran in Manhattan. In 2008 the Metropolitan Transportation Authority briefly ran Van Hool double-decker buses on its Fifth and Madison Avenues Line. However, that year's financial crisis meant the end of the trial period. In San Francisco, California, the San Francisco Municipal Transportation Agency operated one Alexander Dennis double-decker bus as a demonstrator between 12 December 2007 and 8 January 2008. The bus was running on some high capacity routes as trial. In California, AC Transit began experimental use of a double-decker bus on the commuter route between Fremont, California and Stanford University in 2015. Double-decker buses plied route services in Sydney from the 1920s until 1986. Popular makers included AEC, Albion and Leyland. Disputes over one-man operation of double-deckers led to the phasing-out of this configuration. Double-deckers were thereafter limited to charter and tourist services. Double-decker buses were reintroduced to the Sydney area in 2012, with Busways operating regular services from Blacktown to Rouse Hill, in Sydney's north-west. These were expanded in 2013, to traverse routes from Castle Hill and the Northern Beaches to Sydney's CBD. Double-decker buses were also reintroduced to Melbourne to operate between Werribee, Wyndham Vale and Tarneit railway stations in 2015 using buses made in Melbourne. Until 2013-14, double decker buses were used only by tour operators and for long distance coach services operated by Intercity Coachlines and Manabus. They were not used for public transport on urban routes. In the 1970s a number of former London double decker buses were imported for museums, such as the Museum of Transport and Technology who used AEC Regent Low Height (RLH) buses to connect museum sites and for charters. Sydney double decker and more London buses of various models (AEC Regent III RT, AEC Routemasters etc.) were imported by charter and tourist operators and slowly became more commonplace. Bridge heights and shop verandas restricted the use of double deckers around New Zealand until congestion and high public transport use required some innovative solutions. A single double-decker bus arrived in Auckland in early March 2013 for a trial, with more planned to arrive in 2014 if the trial proved successful. The Scania K320UD bus, operated by Ritchies Transport, began revenue service on 11 March 2013 on the well-patronised Northern Express services on the Northern Busway between Albany and Britomart in downtown Auckland. In addition, NZ Bus and Howick & Eastern investigated the use of double-decker buses on the Dominion Road, Mount Eden Road, and Botany to downtown routes. By May 2016, double deckers were running on the busway and on many other Auckland urban routes, operated by several companies, with more to be introduced. Four 87-seat DesignLine double deckers started on Waikato services in 2018. Since 15 July 2018, double deckers, including some fully electric models, have been operating in Wellington. There are currently 28 diesel double deckers running and 10 electric ones. In Argentina, double-decker buses are the second most widely used means of transport for long distance trips in Argentina, only after aeroplanes. Argentina is a very large country, and most trips take a large amount of time, so long-distance bus companies offer high quality services which include waiters, hot and cold beverages and regular food. For very long-distance trips, most companies offer buses with large seats that can be pulled back and be shaped into a bed. Double-decker buses are also used by tourists in Buenos Aires where they're used in city-tours. In Bolivia, double-deck buses are a common means of transportation for long distance trips between large cities such as department capitals. These buses also connect Bolivia with different countries. The double deck buses travel to Argentina, Brazil, Peru and Chile. The buses are equipped with toilets, and several companies offer buses with large seats called Leito (Bus Cama) that can be pulled back and be shaped into a bed. Double-decker buses are common in long-distance services interstate and international (as destined for Argentina and Paraguay). It is possible to see VIP double-decker buses also connecting cities in the same state, such as São Paulo City, Sao Jose do Rio Preto and Ribeirao Preto. Inside these buses there are one TV for each person and boarding service for example. Open double-decker are used for city tours (such as Rio de Janeiro and Bahia). In São Paulo, there was an experience of use for urban services in the 80s, but without success due to problems with the height of the vehicle. These buses are fabricated in Brazil and exported to many countries. Double-decker buses are used in city-tours in Quito, Cuenca and parts of the coast. They are very popular in the touristic district of the Historic District in Quito. Double-decker buses are common on long distance interurban trips. Double-decker buses are common on long distance interurban trips to main cities of the country. Open top double-deckers are used in city tours in downtown Lima and in the tourist district of Miraflores. Pio Delgado Arguedas bought 300 Greyhound buses and was the distributor of the buses in South America and Mexico. He also created TEPSA, and was the owner for years until he sold his company. There have been attempts to build a triple-decker bus. The main problems with such vehicles are instability and also the risk of hitting trees or bridges. In almost all models the third level was a small compartment in the rear part of the bus, such as a triple-decker capable of carrying eighty-eight people from Rome to Tivoli in 1932 or the General American Aerocoach 3 Decker Bus of 1952. The only three-decker with a full-length third level ever built is the Knight Bus created by John Richardson for Harry Potter and the Prisoner of Azkaban cutting up two AEC Regent III RTs and putting them together. Although made by a special effects team for a movie, it was a functioning bus, which even went on tour. Operators worldwide must often decide between articulated and double-decker buses on popular routes. Articulated buses, entirely on one level, offer more room for disabled passengers, luggage and pushchairs; they may also be needed on routes going under low bridges or weak bridges that cannot take high axle loads. Double-decker buses, however, have a smaller road footprint and as such disrupt traffic, or block turning lanes less than an articulated bus. Double-decker buses may be more popular with passengers due to the better view, and to cyclists who may be at risk due to the unpredictable swing of an articulated bus's tail. Articulated buses normally offer more standing room while double-decker buses may sometimes (not always) offer more seats. Articulated buses have less dwell time because of the extra doors, while double-decker buses offer less chances for fare dodgers since there are fewer or no unmanned doors. There have been a significant number of incidents in which a double-decker bus has collided with a low bridge, often a railway bridge. This is often caused by the driver making a wrong turn, driving a route they are unfamiliar with, or being used to driving single-decker buses and forgetting to allow for their vehicle's extra height when driving a double-decker. A collision with a railroad bridge by a Megabus in September 2010 at Syracuse, New York killed four passengers and injured 17. In recent years in the United Kingdom, six people had minor injuries after their bus hit a railway bridge at Stockport in July 2013. A bus collided with a railway bridge at Sileby, Leicestershire in June 2014. An empty bus had its roof removed after hitting a railway bridge in Birkenhead in December 2014. In March 2015, a bus carrying 76 children hit a bridge at Staines, Surrey. Eleven passengers were taken to hospital but none were seriously injured. In the same month, an empty bus had its roof removed after hitting a railway bridge in Isleworth West London. A Stagecoach Highlands bus collided with a railway bridge at Balloch, Highland, Scotland in April 2015. There were no casualties, one top-deck passenger narrowly escaped injury by throwing himself to the floor. A bus operated by Bluestar had its roof removed after colliding with a railway bridge at Romsey in May 2015. An incident in July 2015 in Norwood, London also resulted in the removal of the bus' roof; seven people were injured. Similar incidents occurred in September 2015 in Rochdale, Greater Manchester (seventeen were injured) and in Bournemouth in April 2016, with all thirty passengers escaping without injury. In the film Summer Holiday, Cliff Richard and friends drive a double-decker bus fitted out as a caravan across Europe..
A double deck bus also featured at the end of the final episode of the sitcom The Young Ones. The British sitcom On the Buses featured double deckers, driven by Stan Butler (portrayed by Reg Varney). In Harry Potter and the Prisoner of Azkaban, the aforementioned Knight Bus is a triple-decker bus which can fit under bridges due to magic. During the 2012 Summer Olympics, Czech artist David Černý presented his moving sculpture named London Booster, a full-sized "London double-decker bus" (actually ex-Southern Vectis from the Isle of Wight) permanently doing push-ups with hydraulic-powered human-like arms. This was an accompanying installation outside temporarily Czech Olympic House in London borough of Islington. The double decker bus was also a star in a Saturday morning TV series titled Here Come the Double Deckers in the 1970s. A double decker bus was featured on an episode of Doctor Who. Then he asked if we were going to London. On being told that we were, he spoke for five minutes about the things we should see in the Metropolis. His style was not conversational, but after the manner of a man who was much used to speaking in public or to receiving delegations. The sentences were stately, the voice rather loud and declamatory. His closing words were: "Yes, gentlemen, the way to see London is from the top of a 'bus—from the top of a 'bus, gentlemen." ^ Sultana, Selima; Weber, Joe (April 18, 2016). Minicars, Maglevs, and Mopeds: Modern Modes of Transportation Around the World. ABC-CLIO. p. 101. ISBN 978-1-4408-3494-3. ^ "Axe to fall on Routemaster route". Bus & Coach Professional. 30 January 2014. Archived from the original on 12 August 2014. Retrieved 26 July 2014. ^ Daily, Cecily Liu for China; Network, part of the Climate Publishers (18 July 2015). "Chinese-built zero-emissions electric bus prepares for service in London". the Guardian. Retrieved 11 February 2018. ^ https://austria-forum.org/, Austria-Forum. "Busverkehr in Wien - AustriaWiki im Austria-Forum". austria-forum.org. Retrieved 11 February 2018. ^ "News - Verkehrsverbund Tirol". www.vvt.at. Archived from the original on 28 December 2017. Retrieved 11 February 2018. ^ "10 år med dobbeltdækkere i København". myldretid.dk. Retrieved 11 February 2018. ^ (www.dw.com), Deutsche Welle. "Berlin's Double-Deckers to Get Hydrogen Infusion - Germany- News and in-depth reporting from Berlin and beyond - DW - 24.07.2002". DW.COM. Retrieved 11 February 2018. ^ Liechtenstein. "Liechtenstein Transport". Liechtenstein Marketing. Retrieved 7 August 2017. ^ "Dubbeldekkers: hoog comfort in het ov - OV-Magazine". www.ovmagazine.nl. Retrieved 11 February 2018. ^ Sinisa Jakov Marusic. "Skopje prepares for Double-Decker Buses". Balkan Insight. Retrieved 5 January 2013. ^ Fadnes, Jon Kristian (18 June 2008). "Kjør dobbelt" (in Norwegian). Dagsavisen. Retrieved 15 June 2016. ^ КУЧЕРЯВЫХ, Алексей (2016-10-18). "Что стало с барнаульским двухэтажным автобусом?". KP.RU - сайт «Комсомольской правды» (in Russian). Retrieved 2018-07-11. ^ Андрей Михайлов (January 2016). "«Этажерка» по-немецки". Грузовик Пресс. ^ "Фотоархив Петербургского Автобуса — 90-е". Отечественный Автобус. ^ "Leyland Gets Stockholm's Order - 11th June 1965 - The Commercial Motor Archive". archive.commercialmotor.com. Retrieved 11 February 2018. ^ "First Postbuses from the United Kingdom". Postauto.ch. 19 May 2017. ^ "Sejarah Leyland Titan, Bus tingkat pertama di Indonesia". Awansan.com (in Indonesian). 29 February 2016. ^ Angga Yudha Pratomo (17 January 2014). "Cerita bus tingkat jumbo di Jakarta era 1990-an". Merdeka (in Indonesian). Jakarta. ^ "Lukewarm response on first day of double-decker buses". The Jakarta Post. 25 February 2014. ^ Dewanti A. Wardhani (30 September 2014). "Jakartans take advantage of double-decker tour buses". The Jakarta Post. Jakarta. ^ "Wisata Kota". Transjakarta (in Indonesian). Archived from the original on 10 March 2017. Retrieved 10 March 2017. ^ "Kota Bandung Resmi Operasikan Bus Wisata "Bandros"". www.antaranews.com. Retrieved 7 May 2014. ^ "Double-decker Rapid bus plan for Penang next". The Rakyat Post. 17 June 2015. Retrieved 20 September 2018. ^ York, F W; Phillips, A R (1996). Singapore: A History of its Trams, Trolleybuses & Buses, Volume One 1880's to 1960's. Croydon, Surrey, UK: DTS Publishing. ISBN 1-900515-00-8. ^ Davis, Mike; Phillips, Ron (2006). Singapore Buses Volume 1 Singapore Bus Service Part 2. DTS Publishing. ISBN 9781900515269. ^ "CNA: Three-door bus takes to the road in 6-month trial". Tower Transit Singapore. 2017-03-13. Retrieved 2017-11-18. ^ "Land Transport Guru: MAN A95 – Lion's City DD (3-Door) Concept Bus". ^ "Land Transport Guru: LTA to Purchase 100 Three-door Double-Decker buses". ^ "Land Transport Guru: 60 Electric Buses Procured by LTA". ^ "Land Transport Guru: New Bus for London visits Singapore". ^ "Land Transport Guru: Go-Ahead Group New Bus for London visits Singapore". ^ "seoul-to-get-double-decker-buses-to-ease-overcrowding/". Wall Street Journal. 19 June 2014. Retrieved 10 December 2014. ^ "TransLink launches double-decker bus pilot project". The Buzzer blog. 2017-11-17. Retrieved 2018-03-25. ^ "Daily Hive". dailyhive.com. Retrieved 2018-03-25. ^ "GOTransit.com - New Buses". GO Transit. Archived from the original on 8 January 2017. Retrieved 18 November 2017. ^ "GO adding new, lower double-deck buses to its fleet - Transit Toronto - Weblog". transit.toronto.on.ca. Retrieved 2017-11-18. ^ "Double-decker Project :: Strathcona County". Strathcona.ab.ca. 12 April 2012. Archived from the original on 30 January 2011. Retrieved 5 January 2013. ^ Suárez, Gerardo. "Inician pruebas con pasajeros en Línea 7 del Metrobús" (in Spanish). El Universal. Retrieved 28 February 2018. ^ Salyer, Sharon (1 April 2011). "Community Transit rolls out the double-deckers". The Everett Herald. Retrieved 23 August 2016. ^ Haglund, Noah (29 September 2015). "Community Transit set to get new double-decker buses rolling". The Everett Herald. Retrieved 23 August 2016. ^ Lindblom, Mike (25 March 2014). "Sound Transit to add double-decker buses in 2015". The Seattle Times. Retrieved 23 August 2016. ^ "Community Transit Orders 57 Buses for Expansion" (Press release). Everett, Washington: Community Transit. 5 August 2016. Archived from the original on 6 August 2016. Retrieved 23 August 2016. ^ "Ride taller: Sound Transit orders 32 more double decker transit buses" (Press release). Sound Transit. 28 July 2016. Retrieved 23 August 2016. ^ "Double-decker bus makes its debut | Local News". SanLuisObispo.com. 7 September 2010. Archived from the original on 1 August 2013. Retrieved 5 January 2013. ^ "Board Meetings". AVTA. Retrieved 5 January 2013. ^ Neuman, William (May 22, 2008). "M.T.A. Might Bring Back Double-Decker Buses". City Room. Retrieved 2018-02-09. ^ "NEW 'OLD' BUS IS ON DECK". New York Post. 2008-05-23. Retrieved 2018-02-09. ^ "Double Decker Bus Trial SFMTA Fact Sheet". Sfmta.com. Retrieved 5 January 2013. ^ "Double Deck Bus Test Schedule". Sfmta.com. Archived from the original on 27 February 2015. Retrieved 5 January 2013. ^ Steve Rubenstein (25 February 2015). "Double-decker bus gives Stanford commuters a fresh perspective". San Francisco Chronicle. ^ Dean, John. "The Sydney Atlantean Bus Dispute, 1970-71". asslh.org.au. Retrieved 10 June 2013. ^ Saulwick, Jacob (24 August 2012). "Room at the top: double-deckers return to Sydney". smh.com.au. Retrieved 10 June 2013. ^ Carey, Adam (29 May 2015). "Melbourne-made double-decker bus ready to rumble when Regional Rail Link opens". theage.com.au. Retrieved 27 October 2017. ^ Dearnaley, Matthew (6 March 2012). "Len Brown catches Auckland's first double-decker". The New Zealand Herald. Retrieved 7 March 2012. ^ Dearnaley, Matthew (21 February 2012). "Double deckers on way for commuters". The New Zealand Herald. p. A13. Retrieved 21 February 2012. ^ "More Double Deckers on Auckland Roads". Auckland Transport. Retrieved 21 January 2018. ^ "Scoop Business » Waikato's public transport steps up a level". business.scoop.co.nz. Retrieved 2018-04-20. ^ "Wellington's new double-decker buses arrive as city gets set for a commuter shake-up". Stuff.co.nz. 17 June 2018. Retrieved 27 July 2018. ^ "Three-Deck Auto Bus Carries Eighty-Eight Persons". Popular Mechanics. Chicago: H. H. Windsor, Jr. August 1932. p. 286. Retrieved 22 June 2016. ^ "Old Bus Photos". staleycoach.com. Retrieved 22 June 2016. ^ "A Brief History of Triple-Decker Buses: The Reality". hoaxes.org. 18 September 2013. Retrieved 22 June 2016. ^ Associated Press (9 May 2011). "N.J. driver in fatal Megabus N.Y. crash charged with criminally negligent homicide". www.nj.com. Retrieved 19 July 2015. ^ "Roof ripped off double decker bus in railway bridge crash". The Daily Telegraph. 28 July 2013. Retrieved 19 July 2015. ^ Siddique, Haroon (7 December 2014). "Roof of doubledecker bus sliced off in crash in Birkenhead". The Guardian. Retrieved 19 July 2015. ^ Stubbings, David (27 March 2015). "Staines bus crash recap: Vehicle taking schoolchildren from Essex to Thorpe Park hit bridge". Get Surrey. Retrieved 19 July 2015. ^ Mann, Sebastian (14 March 2015). "Roof ripped off double-decker in crash with rail bridge in west London". Evening Standard. Retrieved 19 July 2015. ^ "Driver who ripped roof off £47k Stagecoach bus by crashing into a bridge was filmed on his phone". Daily Record. 11 November 2015. Retrieved 27 February 2018. ^ Ford, Emily (28 May 2015). "Roof ripped off bus as it crashes into bridge in Romsey". Southern Daily Echo. Retrieved 19 July 2015. ^ Boyle, Danny (19 July 2015). "Norwood bus crash: Seven hurt as roof ripped off London double-decker". The Daily Telegraph. Retrieved 19 July 2015. ^ Gayle, Damien (9 September 2015). "Rochdale bus crash: roof ripped off as double-decker hits bridge". The Guardian. Retrieved 24 April 2016. ^ "Bus roof ripped off in Bournemouth bridge crash". BBC News. 16 April 2016. Retrieved 24 April 2016. ^ "Summer Holiday". busesonscreen.net. Archived from the original on 20 June 2014. Retrieved 20 June 2014. ^ "London Booster 2". Retrieved 11 February 2018. ^ Crane, Jonathan (8 August 2012). "Czech House in London draws Olympic crowds". Prague Post. Archived from the original on 15 August 2012. Retrieved 15 August 2012. ^ "Here Come the Double Deckers". tv.com. Retrieved 20 June 2014. ^ ezoom.com.br. "Marcopolo - Rodoviários – Paradiso 1800 DD". www.marcopolo.com.br. Archived from the original on 2 February 2018. Retrieved 11 February 2018. ^ "Volvo in Mexico". Archived from the original on 9 March 2016. Retrieved 11 February 2018. 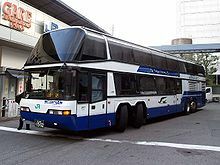 Wikimedia Commons has media related to Double-decker buses.